Marbled orb weavers can be found in residential landscapes and fields from spring until late autumn in Maryland. Despite its scary appearance this orb weaver poses little threat to humans greater than 2 inches tall. Chilly temperatures and the disappearance of foliage put a real crimp on hunting and photographing bugs in the wilds of Maryland. Over the next several weeks, Bug of the Week will delve into our mailbag or visit warmer climes to demystify bugs and their kin. 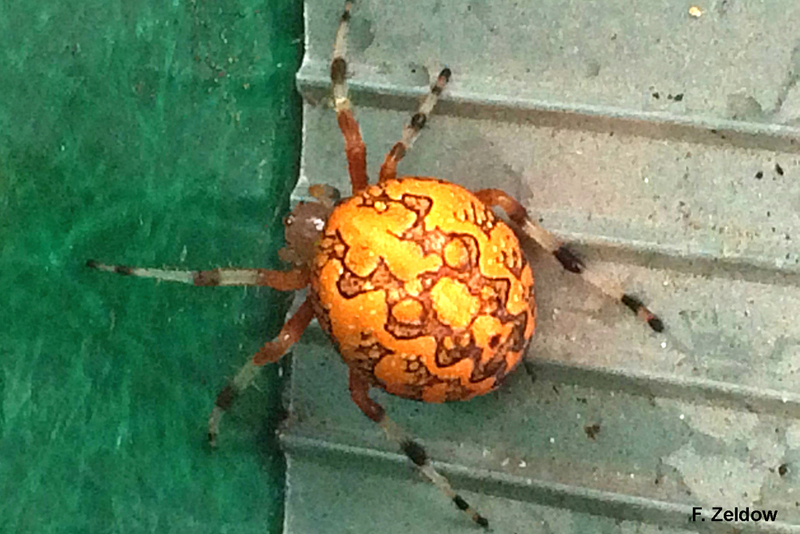 This week we meet a gorgeous creature, the marbled orb weaver discovered by Frederic in his backyard in Maryland. The marbled orb weaver is a close relative of the black and yellow garden spider we met in a previous episode of Bug of the Week. One look at the ornate coloration and patterns on the abdomen of this spider leave no doubt about how this beauty got its name. The marbled orb weaver is found throughout the contiguous lower 48 states and as far north as Alaska. It is also a common denizen of forests and fields in Europe. Like other members of its clan, the marbled orb weaver spins a web with radial threads like the spokes of a wheel upon which spiral sticky capture-threads are placed. Capture-threads are remarkable evolutionary products of millions of years of bioengineering. Each capture-thread has a core of silk bearing scores of tiny droplets of viscous glycoproteins. These glycoproteins give the web its stickiness. Hapless insects that blunder into the web are trapped by the sticky silk until the spider can scamper to its future meal and deliver a lethal paralyzing bite. When not hiding in their retreat, marbled orb weavers sometimes hang out in the center of their web. The marbled orb weaver has a clever strategy to capture prey while limiting exposure to its own enemies. After constructing its amazing web of death, the marbled orb weaver hides in a retreat near the web. The retreat might be a cluster of dead leaves or a piece of loose bark. A strand of silk called a signal thread runs from the web to the retreat. When a potential victim is snared by the web, vibrations travel along the thread and alert the orb weaver to the presence of its prey. The message is simple and clear - dinner is served. Bug of the Week hopes all of you enjoyed a bountiful Thanksgiving feast even if you did not procure it with sticky capture threads. “The National Audubon Field Guide to North American Insects and Spiders”, by Lorus and Margery Milne, and “Estimating the Stickiness of Individual Adhesive Capture Threads in Spider Orb Webs”, by Brent D. Opell, were used as references for this episode. Bug of the Week gives special thanks to Frederic Zeldow for the nice picture of a marbled orb weaver and inspiration for this episode.